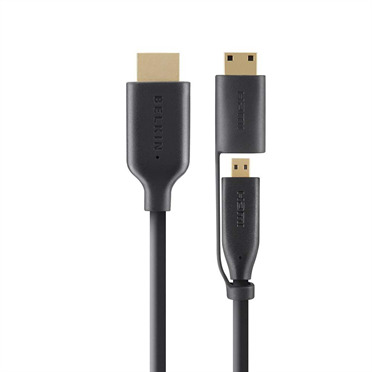 Connect compatible portable devices to your HDTV with the Belkin Micro HDMI Cable. This high-speed HDMI to Micro-HDMI cable is 2 metres in length, featuring a gold-plated male HDMI cable at one end and a gold-plated male micro-HDMI cable on the other for your convenience. Gold-plated connectors ensure the integrity and quality of the video and audio signal is preserved. This cable supports 3D and up to 1080p HD video at 10.2gbps Bandwidth. Connect your devices up to 2 metres away with this handy length cable. For 30 years, Belkin have been experts in the field of audio/visual solutions and are a brand you can rely on.